Hi friends! I hope you all had a great weekend. Today I'm off on a college road trip to a few schools in the Midwest so I thought I would keep this post short and sweet. I've seen several other bloggers make Fall Bucket Lists, and since it's no secret that it's probably my favorite season, I knew I had to jump on board! Above you'll find the things I want to cross off my list for fall, including the essentials like apple and pumpkin picking, as well as other fun ideas like going on a picnic and hosting a movie night. Whenever I'm bored on the weekends, I love consulting a list like this to really take advantage of the season. I hope you get some great ideas from this list too! Please share: what is on your fall bucket list? Anything I'm missing? Solid list!! I think two of my fall bucket list items would be going to a pumpkin patch and picking pumpkins, and maybe watching Hocus Pocus with the fam! Love these! Some others on mine are go pumpkin picking, go to a haunted house, and go to a corn maze! Good luck on college visits! Literally the best time. 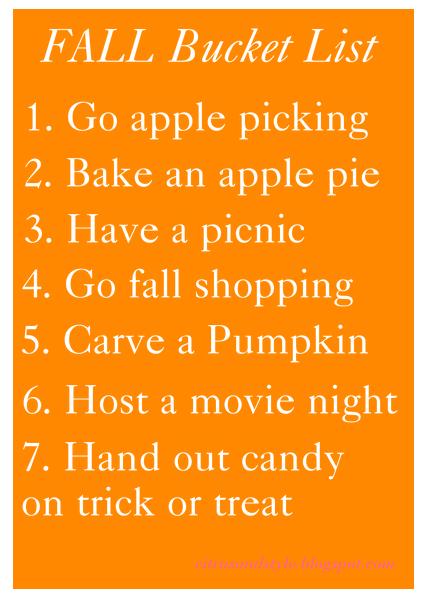 Also love your bucket lists, I definitely have the same goals for fall, but my number one is definitely apple picking! Oh, I want to make a homemade apple pie - that sounds awesome!